The violin, the most commonly used member of the modern string family, is the highest-sounding instrument of that group. Its four strings are stretched over a high arched bridge that permits the playing of one or two strings at a time, as well as the nearly simultaneous sounding of three or four as chords. 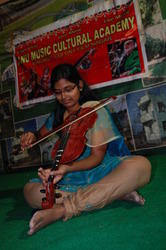 Anu Music Academy Conducts Violin Classes at institute and also takes Online Classes for beginers to prfessionals. > Holding the instrument correctly. > Names of strings and notes. Those who play the violin demonstrate enhanced concentration, as well as increased math, memory and reading skills. Although the violin is known best for its use in classical music, it has become a far more versatile instrument that has also been used in country, folk and even popular rock. The violin, also called a fiddle, is a string instrument, usually with four strings tuned in perfect fifth. This makes it the most difficult of the stringed instruments to learn and requires extreme dedication and enthusiasm.Our trained faulty will help you to be motivated and cross hurdles at all point in time. The violin is a string instrument usually with four strings tuned in perfect fifth. The violin is also known as a fiddle. 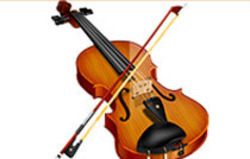 The violin is the smallest, highest-pitched member of the violin family of string instruments, which also includes the viola, the cello, and the double bass. We teach our students using the tried and successful Eta Cohen method of learning which encourages the use of whole bows and to play with a strong firm tone, which will prove a strong foundation for further development.